The Cebu City Traffic Operations Management (Citom) is asking vehicle drivers to bring chalk that they can use to mark the position of their vehicles in case they get involved in a road accident. Are you planning to buy a condo unit? How about investing in one? Primary Homes, which sponsors the Cebu News Digest, prides itself as being “your reliable partner” in building your dream home. In Cebu City, it has The Penthouses at Woodcrest Residences, “where units are located at the top floor that features open corridors within newly designed hallways, an exceptional spacious floor plan with large dining and living areas and a balcony with which to take in the most breathtaking views from sunrise to sunset.” Check it out in the company’s website. TOP STORIES. 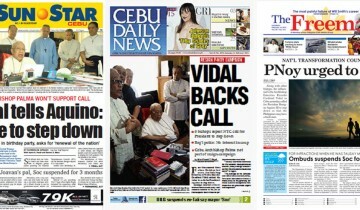 The front pages of Cebu’s 3 English dailies today. Starting Monday, Citom will strictly implement an ordinance requiring all vehicle drivers to bring white chalk and waterproof wax crayon for road markings should they figure in an accident. This is to help prevent traffic congestion caused by road accidents. Drivers of vehicles in an accident are encouraged to place markings on the road, particularly on the exact last position of their vehicles’ tires. Usually, drivers involved in an accident are required to wait for traffic enforcers for documentation. The waiting takes time, which builds up the vehicles affected by the incident. Archbishop Emeritus of Cebu Ricardo Cardinal Vidal joined in the call for President Aquino to step down, along with five officials from the Catholic Church and three members of religious groups. Read our story: Cardinal Vidal, bishops tell President Aquino, Binay, entire government to resign. The Archdiocese of Cebu clarified that while Archbishop Jose Palma was present when Vidal read his statement, this did not mean Palma was joining the call for Aquino to step down.